Watching theatre productions on stage was not a common occurrence in Saudi Arabia. Theatre has not yet become an established practice in the Kingdom. However, in KAUST (King Abdullah University of Science and Technology), pioneering theatre activity is taking place as part of the program of the Office of the Arts in the University. 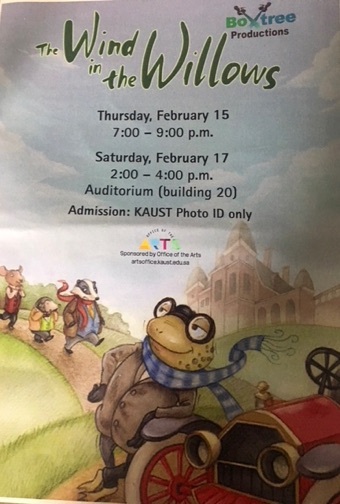 On one fine evening in February 2018, it was a pleasant experience to attend the musical performance of The Wind in the Willows in KSA (The Kingdom of Saudi Arabia). The KAUST theatre was surprisingly well equipped in this private research university town in Thuwal, KSA. This lavish university offers for its expatriate residents and guests recreational activities that include several productions, such as musical concerts, a talent show, and this theatre play. The theatre house has a lounge with a large screen in its entrance. Its large auditorium contains a proscenium stage. The control room is in the central area, surrounded by the seats of the audience. The Wind in the Willows was performed by the touring theatre company Boxtree Productions, a British theatre company, located in Essex. James Franklin and Milly Finch founded the theatre company. 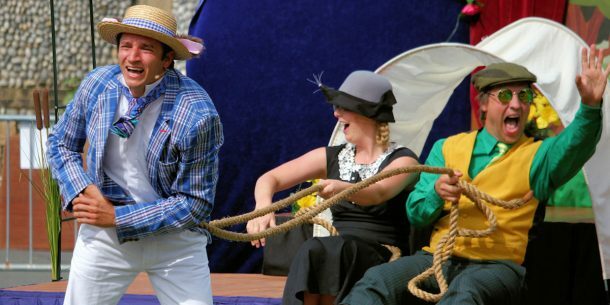 They often tour, showing their unique form of outdoor, family-oriented theatre by performing plays such as The Three Musketeers and Treasure Island. The Wind in the Willows, based on the children’s novel written by Kenneth Grahame in 1908, was presented as a musical performance. The characters are anthropomorphized. So, they represent animals but without wearing animal-like costumes. Such transformation is mainly carried out by the superb acting of a team that managed to grasp the quirks of animals and brought them to life without any exaggeration. Set in two acts, the play features Mole (played by Victoria Jane) as the main character who sets out on an adventure. Along the way, she befriends Ratty (played by Chris Wills) and learns about the river. In her adventures, she meets the wise Badger (James Franklin) and the vain and rich Toad (James Mitchell), owner of Toad Hall. However, two Weasels (Milly Finch and Paul Winterford) decide they want to take over Toad Hall, especially with Toad being away. Toad, whose obsession with cars got him to steal one, ends up in prison but manages to escape. With the help of Mole, Ratty, and Badger, Toad attempts to retrieve his loved home. The family-friendly theatre piece was ideal for the rather conservative Saudi environment. This musical theatre piece thus appealed to the taste of both Western and Eastern cultures. It also introduced the musical genre to a segment of the audience that may not have been familiar with it. With a cast trained both in acting and singing, the play managed to attract the audiences’ attention and engage them in following this exciting adventure. The Poster of The Wind in the Willows. The acting and singing were superbly executed. Victoria Jan, in particular, managed to bring to the imagination the characteristics of a small mole, simply by her crafty twitches, a funny walk, and accurate embodiment of the indomitable spirit of this animal. James Mitchell also managed to capture the vanity of a self-absorbed toad by his larger-than-life gestures. As for the weasels, dressed in black-and-white retro saddle shoes, they were indeed double-crossing weasels! Screen projections created the scenery of the play. The images of the luxurious Toad Hall, or the lonely woods, or the lively picnics were all brought to life by colorful projections. As for the sea, moving long blue and fluffy pieces of cloth downstage delightfully simulated it. The car and the train were also created as movable painted cardboard cutouts that could be carried by the actors. The play had undoubtedly a well-trained technical crew. The roles were evenly distributed. Many of the technical team held small acting roles, but mainly technical roles, such as technical manager and assistant stage manager. The team all collaborated in changing the set or bringing stage props when they were not playing their parts on stage. Overall, the play was delightful to watch. It was quite pleasant to see such talented group in acting and singing. The show was also a good example of solid teamwork. It was delightful to watch the musical of The Wind in the Willows make it to KSA with warm, welcoming applause. Areeg Ibrahim is a Professor of English in the Faculty of Arts at Helwan Universityi, Cairo. She has published widely is both Arabic and English on Arabic and international Drama and is the author of a novel and a number. She is co-editing a volume, Translating Egyptian Realities, with Professor Sirkku Aaltonen. She has also translated a number of Palgrave Macmillan Theatre & books for the National Center for Translation and has presented papers at many national and international conferences.